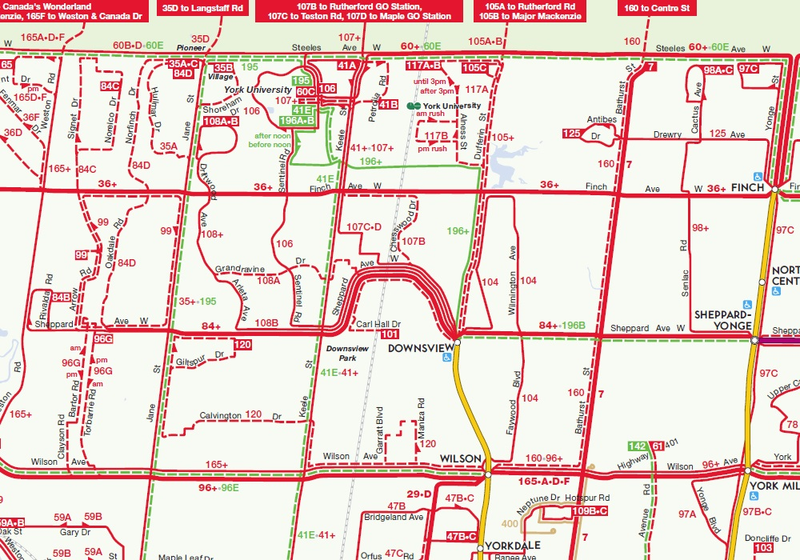 Last week, the Toronto Transit Commission quietly introduced a new system map on its website. The map, a 3.8 MB PDF file, can be directly accessed here. This new system map, which includes all scheduled routes including the limited-service community buses and the Blue Night network, is very different than previous editions of the TTC’s “Ride Guide,” but I think it is the best edition yet. That said, there are a few tweaks that I would like to see. Below is a screenshot of the new 2016 map, showing York University, Downsview Station, and North York Centre. Unlike previous editions, the new Ride Guide is not to scale; subtle curves and bends in the road network are dispensed with in favour of a diagrammatic style, which shows transfer points very well. (It reminds me of the Los Angeles Metro system map.) 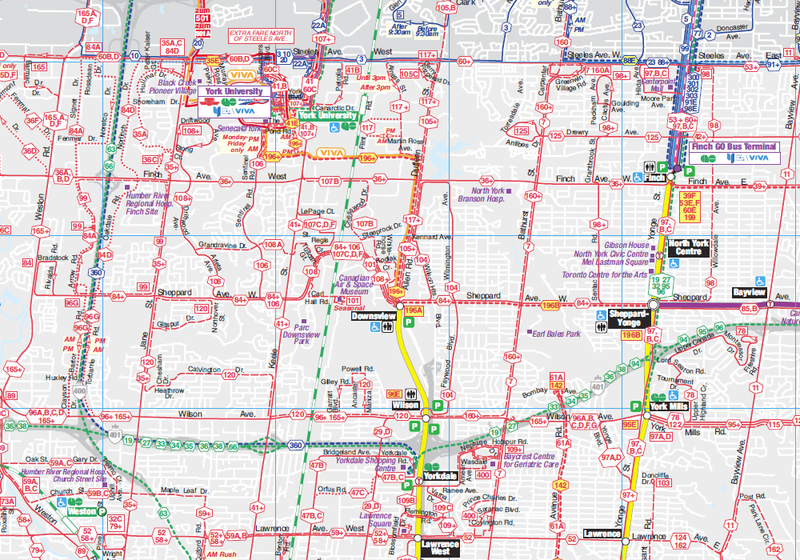 Like the 2012 edition, shown below, only the streets served by surface routes are illustrated, but landmarks (such as hospitals, post-secondary education institutions, and major parks) are given more prominence than in previous maps. GO Transit rail lines are more prominent (with the same colours used on GO Transit maps and schedules), and there’s an effort to show connections with other transit systems, such as GO buses, and suburban agencies such as York Region Transit, Miway, and Brampton Transit. Screenshot of the 2014-2015 edition of the TTC Ride Guide, showing the same area as the 2016 map. From 1994 to 2012, the TTC’s official system map included the routes of adjoining transit systems (see screenshot below). Note the YRT, GO Transit and Brampton Transit Züm routes converging on a very crowded York University. Depicting the connecting networks was certainly useful, but it added to a very cluttered map (which included the entire street network); it also relied on every other agency to provide timely updates. Removing the other transit agencies’ bus routes in 2014 allowed the TTC design team and cartographers to concentrate on their own system. In 2014, the system map was stripped of almost all features apart from the TTC’s own routes, a decision I criticized in a previous post. All landmarks were removed, as were all connections, apart from faint lines showing GO Transit rail corridors. It was easier to read, but went too far in removing important and use information. But it had a few improvements, such as highlighting the “frequent service network” – surface routes that operated every ten minutes or better at most times of the day. Express bus routes were better depicted. The 2016 edition restores these features lost in 2014. In a few places, the logos of the suburban transit agencies are once again shown, such as York University (where Brampton Transit, GO Transit and York Region Transit connect) and Pearson Airport (where Brampton, Miway and GO also operate). The contact information for the five neighboring systems is also included on the map. The addition of the frequent service category remains. Overall, I think the new map looks great. Surface routes are clearer, GO Transit rail lines are more prominent, and more points of interest are shown. Not only does downtown Toronto get a new inset, so does a complex section in north Scarborough, where the 102 Markham Road, the 53 Steeles East, and the 42A Cummer routes converge. The TTC design team has done a fine job. Hospitals are labelled inconsistently. Humber River, Sunnybrook, and Scarborough Centenary are, but North York General, Etobicoke General, Scarborough General, St. Joseph’s, East Toronto General, and the downtown hospitals are not. Some suburban connections are shown, most are not. Pearson Airport shows GO, Brampton, and Miway logos, and York U shows GO, Zum, and YRT logos, but they are missing from Humber College, a major terminal for Brampton Transit (511, 11, 50) and Miway (22, 107), it’s a terminus for a YRT route as well. Rouge Hill GO shows a DRT logo, even though this is a very limited service, but there isn’t one for Miway at Long Branch, where two major routes, 5 and 23, terminate. I’m not sure I like how branches are labeled now; I miss the use of the “+” that denoted a section of a route on which all branches operated on. Hopefully, we will see these relatively minor issues corrected in the next edition of the Ride Guide, which will likely be issued later in 2016. If you’re interested in the history of TTC maps, Transit Toronto has a fine archive of old system and subway maps dating back to the 1930s. It’s worth a look. This entry was posted in Maps, Toronto, Transit and tagged Map, Ride Guide, TTC. Bookmark the permalink. One part of the over-simplification is that they don’t even identify every street that buses operate on. For example, look at the triangle on route 104 just east of Downsview Station. It isn’t indicated where the 35A accesses Jane St. north of Finch. Another is how route 120 travels from Calvington to Jane St. north of Wilson, or how the 97C loops SW of Yonge/Steeles. Are these just drafting errors, or intentional omissions?